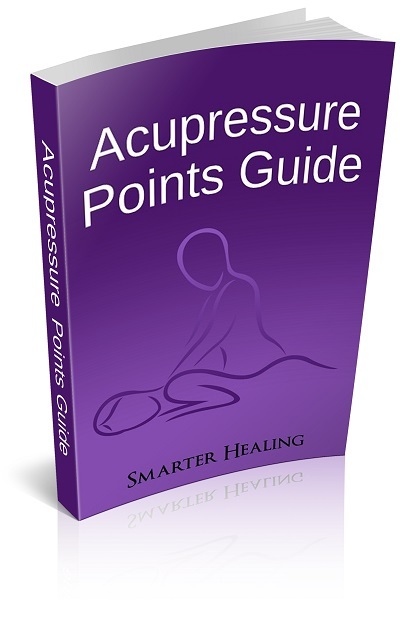 Can acupressure relieve pain & tension in your neck? This page will show you some good acupressure points to use for relieving pain and stress that has accumulated in the muscles in your neck. We all get stressed out sometimes. And for many of us, that stress expresses itself in the body as tension in our muscles. 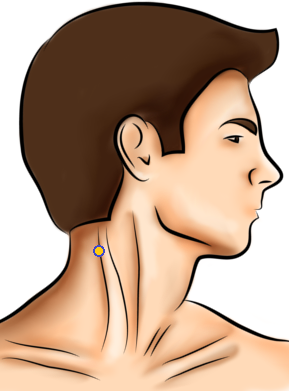 The neck is a common place for all sorts of stress and tension to build up. It's an area full of muscles that we use every day, even while sitting down. That's because our neck is always responsible for controlling the movement of our head and holding it up. The neck can also be affected by the health of the spine. A problem in the spine can manifest as a pain in the neck. It's also possible that perhaps you've simply injured your neck via strenuous activity or sports. If that's the case, using the right acupressure points can promote healing of your neck by increasing the flow of life energy to the appropriate muscles. Acupressure and other energy-based healing techniques have been known to bring about healing of even chronic illnesses. If you suffer from chronic spinal injury or pain, or any other type of chronic neck pain, these acupressure points could be of use to you. Without further ado, here's the acupressure points for neck pain and tension that will help you most. 1. Gallbladder 21, on the top of the shoulder, about two inches away from where your shoulder meets your neck. 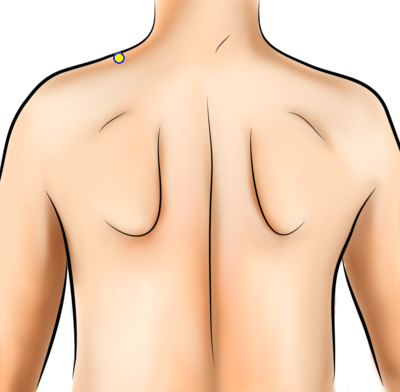 This acupressure point will help relieve stiff muscles in the neck, and tension in the shoulder as well. Other benefits of this point include a reduction in irritability, which may accompany the muscular pain and discomfort you're experiencing. This point is also known to help increase blood circulation in the body, which promotes healing all around. 2. Bladder 10, on the back of the head, below the base of the skull. This pressure point will help relieve stress and rejuvenate you from physical exhaustion. It will also help loosen up a stiff neck, and even helps heal sore throats. 3. Gallbladder 20, on the back of the head, just below the bottom of the skull. This acupressure point will help relieve your neck pain. It also helps relieve stiffness of the neck muscles, arthritis in the neck, and even helps get rid of headaches which may be associated with the tension you're experiencing in your neck and head area. 4. 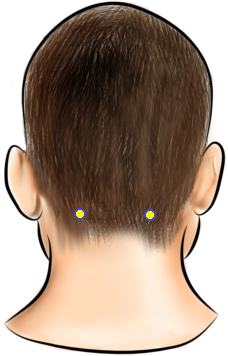 Triple Energizer 16, on the back of the head, at the indentation where the bottom of the skull ends, behind the earlobe. Use this pressure point to relieve stiff necks and neck pain. It will also help relieve shoulder pain and headaches. 5. Governing Vessel 16, in the center of the back of the head, in the hollow underneath the base of the skull. This acupressure point is great for everything involving your head. It helps restore health to your eyes, ears, nose, and throat. This point helps relieve headaches, vertigo, and neck problems. It will help loosen up stiff neck muscles and reduce neck pain. 6. 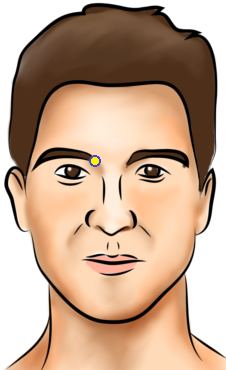 Bladder 2, on the face, along the eyebrow, where the eyebrow meets the nose. This acupressure point on your face will relieve your neck pain. It is also great for other issues involving the head, including headaches, allergies such as hay fever, and eye fatigue. It's also an effective point at healing pain in general anywhere on the body.